Bushmaster is a Marvel villain known for battling Iron Fist and Luke Cage. Bushmaster is one of the villains in the Luke Cage Season 2 Netflix series. Bushmaster will be played Harlem born actor Mustafa Shakier. Iron Fist #15 is last issue of the first volume of Iron Fist, the series. 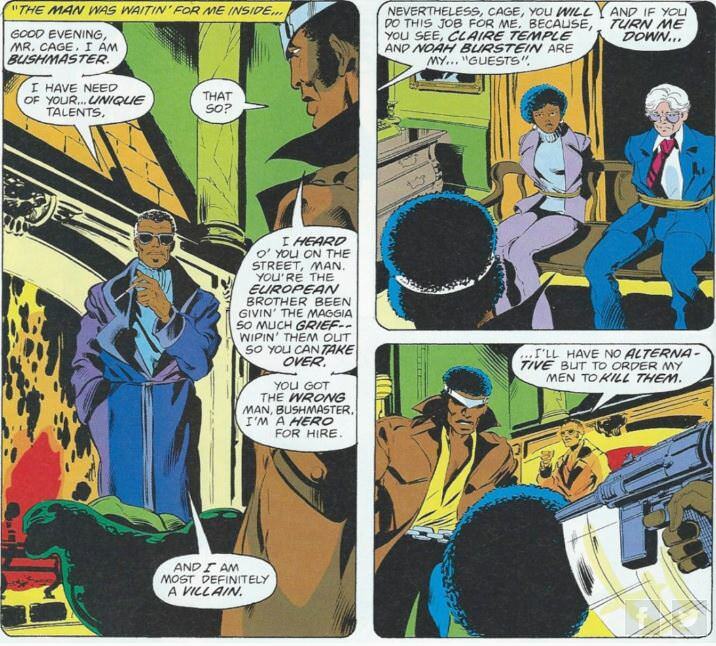 Bushmaster thus appears in the end of Iron Fist's first volume of solo issues. This introduction of Bushmaster leaves his plot and introduction unresolved but it carries over into Marvel Team-Up #63 and 64 and then into Powerman #48 and #49. Power Man is renamed at issue #50 to being called "Power Man and Iron Fist". Bushmaster thus serves as kind of bridge between Iron Man and Luke Cage's solo series and their famous team up series. 2nd Bushmaster Appearance: Quincy McIver first appears as Bushmaster in Captain America #310. He is more snake like in apperance than the original and is part of the Serpent Society. Toylab is member of the Amazon Affiliate program which allows us to provide you with links that go directly to Amazon where you can easily buy and ship awesome and fun products. There have been two men who have worn the mantle of Bushmaster. Both have been enemies of Luke Cage and Iron Fist. The two men are brothers of each other. John and Quincy McIver grew up on a Caribbean island where as children they both worked as low level criminals. When Quincy was caught shoplifting he squealed on his brother. This led to John baddly beating his brother and then killing the shopkeeper that had caught his brother. He rose up the criminal ranks and became under the employ of a crime lord Herve Argosy. John managed to get his brother Quincy added under the ranks of Argosy. However, on his first mission Quincy had his limbs shopped off in a propeller of a motorboat. John came to Quincy's bedside in the hospital not to give him sympathy but to mock his brother's stupidity and weakness. John then left the caribean island for Europe and took on the name of John Bushmaster. John McIver now going under the criminal name of John Bushmaster managed to take over the European Branch of the criminal syndicate known as the Maggia. He began to expand the syndicates activities into the US where his moves attracted the attention of the FBI, CIA and Interpol. This led to Misty Knight infiltrating the group beneath the alias name of Maya Korday. Misty managed to gather a lot of intel on Bushmaster but before she could make an arrest she heard him put out a hit on Iron Fist. Wanting to protect her friend she blew her cover and forced Bushmaster to give her the details of the hit. Bushmaster attempted to have both Misty and Iron Fist taken out at the hit but failed. Bushmaster then kidnaps Noah Burnstein and while at Seagate prison has the process that gave Luke Cage his powers duplicated onto him. Burnstein is coerced to even increasing the amount of energy in the process as to make Bushmaster even more powerful than Cage. Bushmaster is confronted at Seagate by Luke Cage, Iron Fist, Misty Knight and Colleen Wing where he proved to be more powerful than Cage. During the battle a vat of chemicals is broken and a powerline electrifies Bushmaster causing an explosion that the heroes believe killed him. Bushmaster is revealed to be alive but is nearly completely fused and can barely move. His skin, flesh and bones now have a metallic quality to them. Bushmaster has his men kidnap the wife of Noah Burnstein to coerce him to helping him again. He captures and attempts to use Luke Cage as a guinea pig but Iron Fist rescues his partner just in the nick of time. His son tries Cruz tries to resurrect his father but this ultimately fails and he crumbles into dust. After losing his limbs Quincy is approached by Roxxon Oil with the means of becoming a powerful villain. His limbs are replaced with robotic appendages and a snake like tail instead of legs. He took over the name of his brother who had since passed. After working as an agent for Roxxon he is later brought into the organization called the Serpent Society. Bushmaster enjoyed being part of the Serpent Society and made friends with Sidewinder and Diamondback. His first mission as part of the Society his limbs were re-severed in an attempt to kidnap MODOK. He was saved from this situation by Diamondback and received new robotic arms. Diamondback complicated Bushmaster's situation by leaving the Society and joining forces with Captain America. 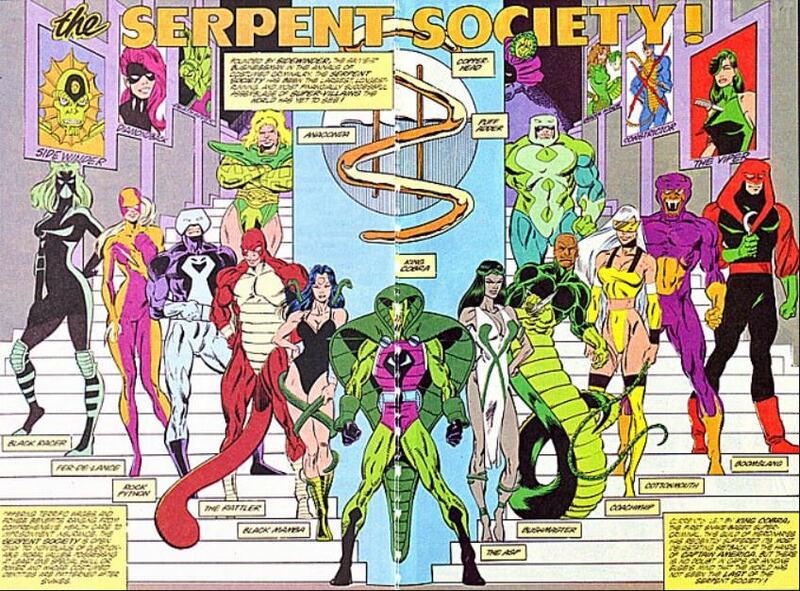 The Serpent Society began to go through various leaders including Viper who attempted to poison Bushmaster. Bushmaster was saved from this by Captain America and Diamondback. Sidewinder eventually gave control of the organization to Cobra. During a trial of a captured Diamondback, Bushmaster voted to let her live. After the trial he was forced to fight Diamondback, as well as the heroes Captain America and Paladin. Losing his fight against the heroes he was apprehended and taken into the Vault. Bushmaster joined the Thunderbolts being led by Baron Zemo. Alyosha Kraven collected Bushmaster as part of an attempt to create a zoo of animal themed supervillains. Bushmaster and the a group of veteran Serpent Society Members battled the New Avengers in a tropical island. Bushmaster was defeated by the combined might of Luke Cage and Ronin. He appears again in different iterations of the serpent society including a group called Serpent Solutions and as members of the Army of Evil in the Secret Empire series. While attacking a woman in the woods along with Viper and Puffadder he runs into a man who appears to be Steve Rogers who defeats them. 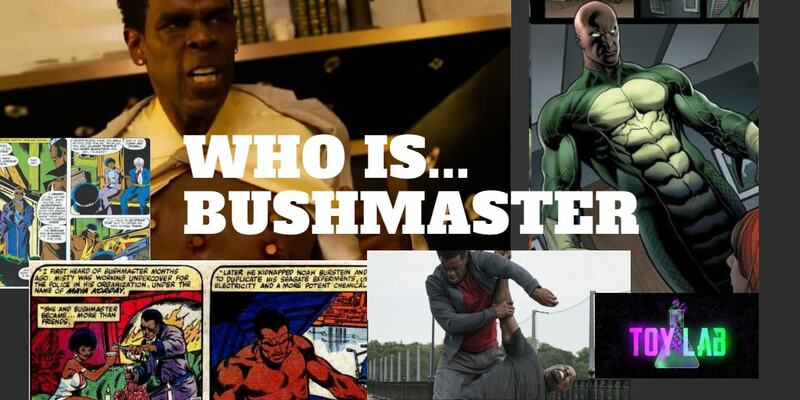 The first Bushmaster has the same powers as Luke Cage. He hunted down the scientist Noah Burnstein and had him replicate the experiment he did on Luke Cage but with more energy being used so that he could be even stronger. The 2nd Bushmaster has robotic arms and a tail added giving him super strength and other weapons. He has a 14 ft long tail that is highly durable and super strong. Fangs are attached to his bionic arms with sharp needles that contain various fast acting poisons. The poisons are all derived from various snake venoms. Bushmaster will appear in the 2nd season of the Luke Cage Netflix series and be played by Mustafa Shakier. 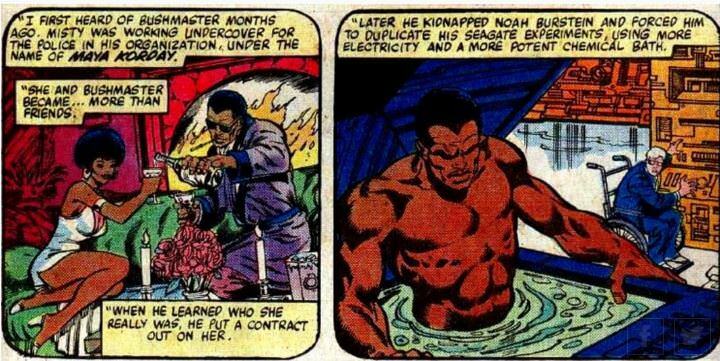 Bushmaster appears to have the same type of powers as Luke Cage but at a greater level.